I first stumbled across T2 online, and then in-person when I was on a trip to New York City last October. Unfortunately, I had found the T2 store on my last day and my luggage was already woefully over stuffed so I couldn’t justify buying anything else. Fast forward a few months and I wound up buying some things off of T2’s website! I picked out the Under The Sea Jade Tea For One set because I love cup & saucer sets, and I’m a sucker for a cute teapot. The Under The Sea Jade Tea For One set came to me with each piece individually wrapped in a lot bubble wrap, in a black box and that was in a shipping carton. There was a lot of packaging material to the point that I felt kind of bad about my order because of all the waste involved. However, with all the packaging material, each piece to this tea for one set arrived intact and perfect. 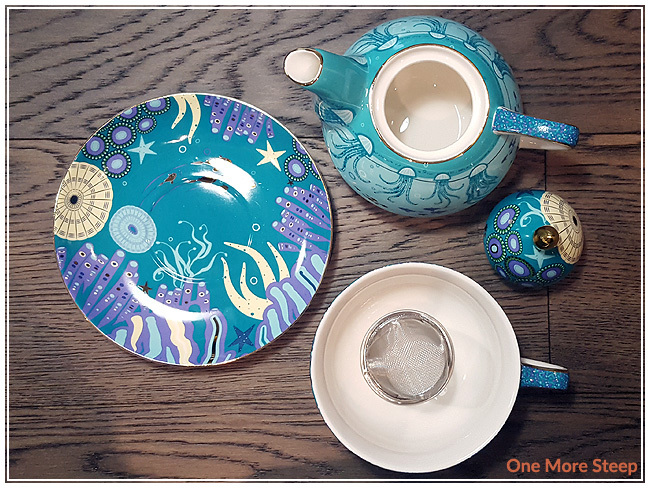 Under The Sea Jade consists of five pieces: tea pot, lid, infuser, cup, and saucer. I love the design on this tea for one set. I spent a good portion of my undergraduate degree studying invertebrates and the oceans, so I was quite smitten with the artwork when I first saw it on the T2 website. Under The Sea Jade consists of illustrations of jellyfish, coral, anemone, and fish. There is gold detailing throughout the design and it really just pulls it all in together. The teapot has a 300ml capacity while the cup has a 200ml capacity. I hand washed of all the components of the Under The Sea Jade Tea For One set prior to use – using warm water and dish soap. T2 recommends doing a gentle hand wash and the product page states that it is not suitable for the dishwasher or the microwave. The first time I used this set, I was steeping Lemon Lily’s Rose Petal Chai. The stainless steel infuser isn’t very large, but neither is the teapot so I didn’t mind that too much. Both the teapot and the teacup get pretty warm when it’s in use, so watch your fingers/hands. The mesh of the stainless steel infuser did a fairly good job of keeping all of the tea leaves together, which I appreciated. The pour from the teapot to the cup was good, there was no dripping. 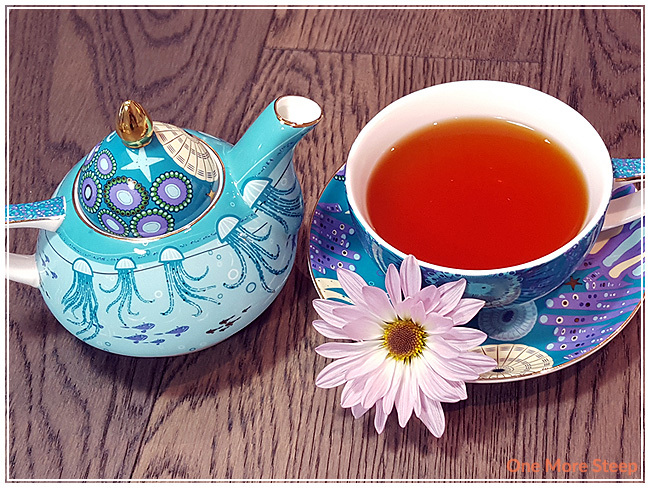 I found that the handle of the teapot is almost too small for my hand to lift comfortably, depending on how I hold it – I usually wear a size small in adult gloves, so if you’ve got larger hands, you might find the teapot to be uncomfortable to use. The teapot is roomy and is wide so it makes for a nice shape to use both of your hands to cup if you’re looking to warm your hands. 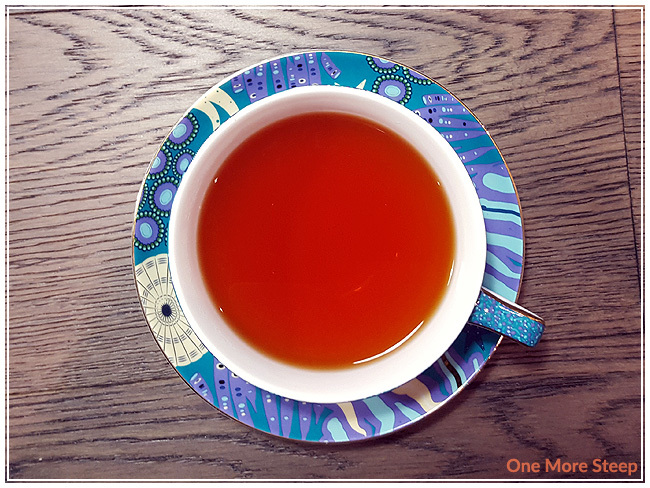 I love the saucer – for both the size and the design, it’s just cheery to see the gold fish. I found when I poured the tea from pot to cup, the remaining tea is out of the way of the infuser, so there wasn’t any risk of my tea over steeping. One potential downside, there’s no little tab on the infuser to make it easier on you to remove the infuser if you wanted to after the tea has steeped without potentially burning your fingers on the stainless steel infuser. Despite the teacup having the capacity for 200ml versus the 300ml of the teapot, I didn’t find myself filling up the cup to the brim, so I found that the teapot holds about two teacups worth of tea, which is nice as its a personal-sized teapot. I found that the teapot sits well into the cup when it’s stacked for display in my cupboards. 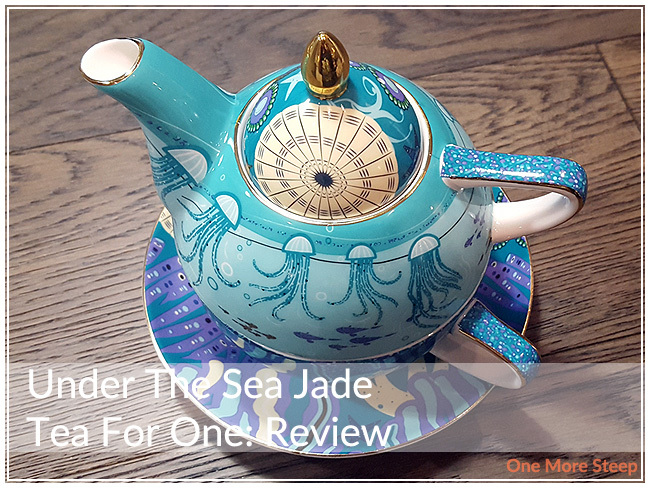 I loved T2’s Under The Sea Jade Tea For One. I love the illustrated design, I think it’s really pretty and love the gold accents. I had no concerns regarding the usage of the teaset, aside from the handle. My hands aren’t the largest, so if I’m feeling like the handle might be a little small, I’m thinking others might have an issue with it as well. That said, it performs its function well, has a beautiful marine-themed design, and was packaged well for shipment. I wish there was something somewhere to say that the bubble wrap was biodegradable though, because there was a lot of plastic bubble wrap involved in getting this teaset safely from T2 to me.